Solution: If you don’t know witch application is given this error, you can copy the GUID behind CLSID and start the registry editor (regedit.exe) and search for the GUID. You will find witch application is creating this error. After you know that you start Administrative Tools – Component Services. Expand Component Services, Computers, My Computer, DCOM Config. Then find the found application, in this case IIS WAMREG, choose properties and go to the security tab. Then at Launch and Activation Permissions, choose customize (if not already chjoosen) and Edit. 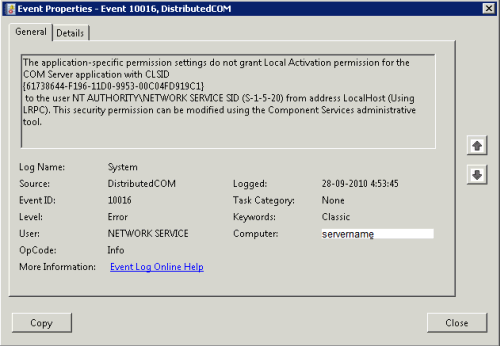 Add the user account given in the event error, in this case Network Service account and give the account allow Local Launch and Local Activation rights. After that close all windows and restart IIS service. 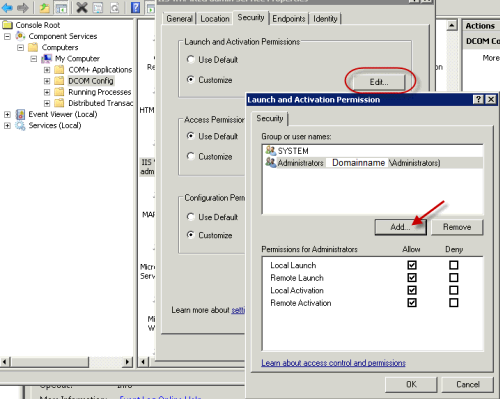 Update: There is a similar error about another CLSID but the options to change permissions are greyed out. Read here how to solve this issue. Posted in Blog, SBS 2008, Windows 2008, Windows 2008R2 by ronnypot at September 29th, 2010.